Before winter arrives is the time to not procrastinate on fireplace maintenance. Many Minnesotans and Western Wisconsins use fireplaces to keep warm and enhance the beauty of their homes. This equipment requires occasional cleaning and safety inspections. However, the maintenance needs of a fireplace differ greatly depending on whether it uses gas, wood or electricity to produce heat. Although they don’t generate ashes or creosote, natural gas fireplaces still demand periodic upkeep. They require thorough inspections every one to two years. Professionals often fine-tune such components as the millivolt generator and ignition system. They also use specialized cleaners to remove a white cloudy film from the inside of the glass. When technicians service these fireplaces, they typically clean heat exchangers and inspect the equipment for any natural gas leakage. Some service providers also repaint scratched surfaces and add new embers when necessary. If a gas fireplace connects to a chimney, homeowners can maximize safety by scheduling yearly chimney inspections. Fireplaces that run on electricity usually contain a set of light bulbs. They provide illumination for the artificial flames and logs. Owners need to replace these bulbs when they fail; this normally happens after about 30 months. Some electric fireplaces also feature air filters. They require washing or replacement on a monthly basis. Minnesotans can clean fireplace inserts, mantles and glass with household cleaning products and a cloth. The appropriate cleaners vary depending on the materials used in the construction of this equipment. If an electric fireplace features a wooden mantle, a wood polish may be applied. A wood-burning fireplace delivers the most realistic experience, but it needs frequent maintenance. Doors require routine cleaning to keep the glass clear. Owners must remove ashes if they become deep enough to reduce airflow. This happens when they reach the same height as the grate. Chimney maintenance proves especially important for wood fireplace users. Each chimney requires a thorough inspection and cleaning at least once every 12 months until your professional chimney sweep advises otherwise. Many Minnesotans sweep them more often because they burn considerable quantities of wood during the state’s long, cold winter. This improves safety by ensuring that creosote won’t trigger a fire inside of the chimney. To sum it up, all fireplaces need regular maintenance to enhance performance and preserve their attractive appearance. Wood-burning models require the most upkeep, while electric units need the least. Various companies offer professional fireplace maintenance in St. Paul, Duluth and other cities across Minnesota. 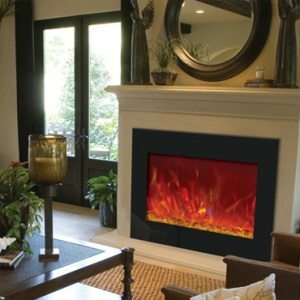 Energy Savers is one company located near Stillwater, Mahtomedi and White Bear Lake that can service most brand gas fireplaces. If we can’t help you, we can provide you with great referrals.